Rio Tinto (RIO) PT Lowered to GBX 5,200 at JPMorgan Chase & Co.
German grocery chain Aldi stated that it would invest $3.4 billion to expand its U.S. store base to 2,500 by 2022 in an announcement made on Sunday. The company is also planning to remodel 1,300 of its stores at a cost of about $1.6 billion. 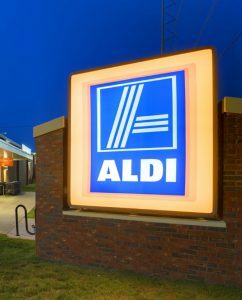 The investment will raise Aldi’s capital expenditure to at least $5 billion in new and remodeled stores over the next five years. Aldi currently operates 1,600 U.S. stores. Earlier this year, Aldi said it would add another 400 stores by the end of 2018. The latest store expansion will create 25,000 U.S. jobs and make Aldi the third-largest grocery chain operator in the country. Aldi’s stores are smaller than traditional supermarkets and are 90 percent stocked with house brands. In recent years, the company has added more produce, as well as organic and gluten-free offerings, in an attempt to appeal to more mainstream shoppers. The chain has also started offering fresh fish, expanded its meat selection, and increased its selection of national brands. The announcement comes days before its fellow German discount grocery store chain Lidl opens its first American stores. Lidl also uses the small-store model and offers a limited selection of products, the vast majority of which are exclusive brands. Lidl will open the first of its U.S. stores in Virginia and the Carolinas on June 15. Lidl reportedly plans to open 200 stores in the coming years. The company has already announced plans for as many as 100 new openings by the summer of 2018. Analysts have estimated that it could roll out as many as 600 U.S. locations over the next five years. The expansions come at a time of intense competition and disruption in the U.S. grocery industry. Aldi Chief Executive Jason Hart said in a statement, “We’re growing at a time when other retailers are struggling.” The U.S. grocery market has seen 18 bankruptcies since 2014. A deflationary spiral has seen food prices drop for 17 straight months, the longest such streak in more than 60 years. The fast pace of expansion by Aldi and Lidl is likely to further disrupt the market. The German private-label giants could put more pressure on conventional retailers like Wal-Mart Stores Inc. and Kroger Co. to lower their prices. Hart said in May that Aldi intended to have prices at least 21 percent lower than rivals and added that the chain’s prices were also up to 50 percent lower than traditional grocery chains. Wal-Mart Stores, the world’s biggest retailer and the largest U.S. grocer, is now pushing vendors to undercut rivals by 15 percent. Rio Tinto PT Lowered to GBX 5,200 at JPMorgan Chase & Co.